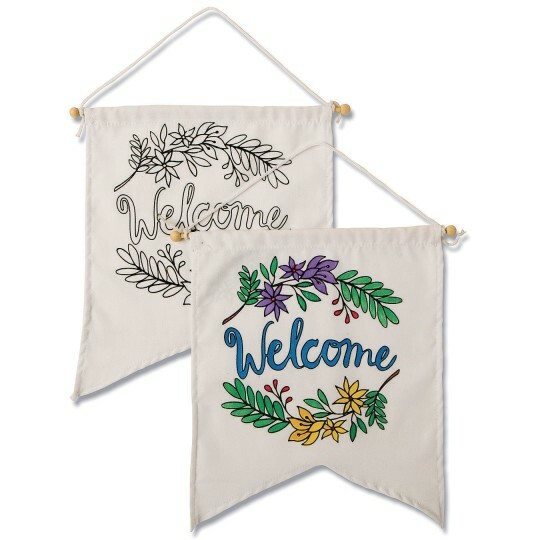 Add a big welcoming gesture! 100% cotton banner printed in velvet flocking with our exclusive illustration! Includes pre-tied cording on wood rod for convenient hanging anywhere! Flag is hemmed on all sides. A great coloring project for everyone. Perfect for groups, healthcare & senior living facilities.... even camps & rec organizations. Can be colored and personalized with permanent or fabric markers, fabric paint, even tie-dyed. Decorating materials sold separately. Fabric measures approx. 8-3/4”W x 10”L. Pack of 12. Rod measures 10”L; cord measures 20”L.